Documentation: Specimen: Mount at WSC, 1 Jan 1978 Dixon, Dixon Co.
Taxonomy: Two subspecies are recognized, one each in Eurasia and North America; nebulosa occurs in North America (Clements 2016, Gill and Donsker 2017). Record: There is one record. 1 Jan 1978 Dixon, Dixon Co (cited above). The above specimen is the only documented record. The bird was first seen 31 Dec 1977 and illegally shot 1 Jan 1978 near Dixon; it was a female in underweight condition (Lock 1978, Mollhoff 1979). There are additional undocumented reports. A specimen reportedly taken near Omaha, Douglas Co 17 Dec 1893 (Bruner et al 1904) cannot now be located, although it may be that purchased from the Northwest School of Taxidermy in Omaha in 1912 and now #2537 at HMM (Bray et al 1986). Two were said to have been shot about 1896 near Maywood, Frontier Co, and exhibited there for some time (Brookings Notes, Bray et al 1986). According to Bruner et al (1904), a mounted specimen in a saloon at Long Pine, Brown Co was said to have been taken in the vicinity. Comments: This species is a resident in northwest Wyoming (Faulkner 2010) and in northern Minnesota (Minnesota Breeding Bird Atlas 2017). There are no records for Colorado, Kansas, or Missouri, and only three from South Dakota, all during Jan-Mar (Tallman et al 2002). There are at least 15 records for Iowa during Dec-May (Iowa Ornithologists Union 2018); two were present during winter 1996-97 (Cecil 1997) and as many as three during winter 1995-96. The winter of 1995-96 was the most recent of a few large invasions since that of 1968-69, including 1977-78, when the Nebraska bird appeared (Mollhoff 1979), and 1983-84, when the first South Dakota bird appeared (Kent and Dinsmore 1996). In Minnesota, the probable source of Nebraska and Iowa birds, fall movement becomes noticeable some years in Oct, sometimes developing into invasions, with most birds departing by mid-Mar (Janssen 1987). However, even in Minnesota the species is accidental in the south (Janssen 1987). Photograph (top) of a Great Gray Owl specimen taken in Dixon Co 1 Jan 1978 and now housed at Wayne State College by Mark Hammer. Brooking, A.M. Notes. Bird specimen records. Manuscript in NOU Archives, University of Nebraska State Museum, Lincoln, Nebraska, USA. Cecil. R. Field Reports- winter 1996-97. Iowa Bird Life 67: 57-63. Iowa Ornithologists’ Union. 2018. Iowa Records Committee reports of Iowa rare bird records, accessed February 2018. Janssen, R.B. 1967. Birds in Minnesota. University of Minnesota Press, Minneapolis, Minnesota, USA. Lock, R.A. 1978. 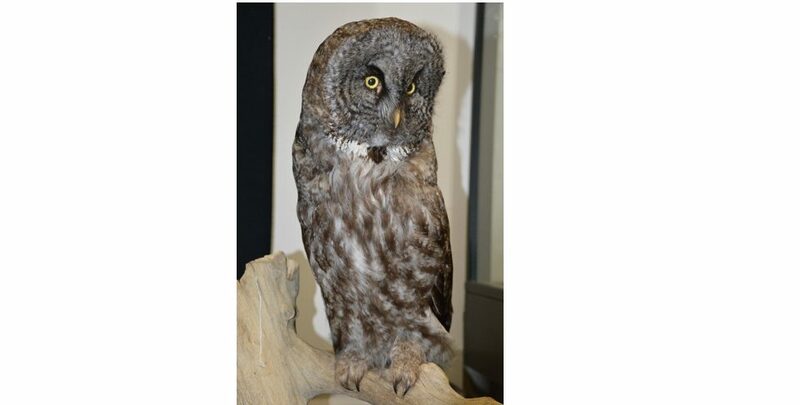 A second Great Gray Owl record from Nebraska, and other recent owl records. NBR 46: 16. Minnesota Breeding Bird Atlas. 2017. Great Gray Owl (Strix nebulosi), accessed 23 May 2018. Mollhoff, W.J. 1979. Great Gray Owl distribution, winter 1977-78. NBR 47: 62-65.